For the third straight year at Chesapeake Energy Arena and for the 7th straight year in a row, the Thunder will be one of the NBA’s showcased teams on one of the NBA’s most signature days of the year. The opponent tonight is the Houston Rockets in a rematch of last season’s 2017 Western Conference First Round series, in which the Thunder fell 4-1. Heading into the matchup, the Thunder knows that defending without fouling will be absolutely critical in order to stay in the game for all 48 minutes. With the way that players like James Harden can get to the free throw line, the Thunder will have to stay disciplined both on drives, but also out around the three-point line. Head Coach Billy Donovan and the staff recognize that Houston is going to primarily take just three types of shots – at the rim, from behind the three-point line and at the free throw line. Searching for only the most efficient opportunities has its benefits, and the skill level of the Rockets means the Thunder will have to bounce back from playing great defense, only to see a difficult, contested shot go in the basket. Donovan’s club has to stay undeterred. But resilience has been a hallmark of the Thunder brand of basketball since Day 1. On the other end of the floor, it’s clear that the Thunder is starting to turn the corner on offense. After two efficient offensive games against the Utah Jazz last Wednesday and then at home against the Atlanta Hawks on Friday, the Thunder stayed patient in Salt Lake City on Saturday and ended up making 9-of-16 three-pointers in the second half to rally for a 103-89 victory. The Thunder now sits at 18-15, tied for 5th in the Western Conference and just two games back of both the fourth spot and the top place in the Northwest Division. Donovan’s group has now won 10-of-13 games since the calendar turned over to December, and the team’s play has elevated to another level since the start of that East Coast road swing that tumbled into this stretch of 7-of-8 games at Chesapeake Energy Arena, which continues tonight. - On Saturday in Utah the Thunder managed to generate enough energy on the second half of a back to back and third game in four nights to make the crucial hustle plays. That included 15 offensive rebounds, which led to 16 second chance points compared to just 6 extra possessions and 8 corresponding points for Utah. In the month of December, the Thunder ranks fifth in rebounds per 48 minutes, including first in offensive rebounding. Thunder players have explained that playing disciplined, coordinated offense helps everyone be in the right positions to get those extra opportunities to extend possessions. 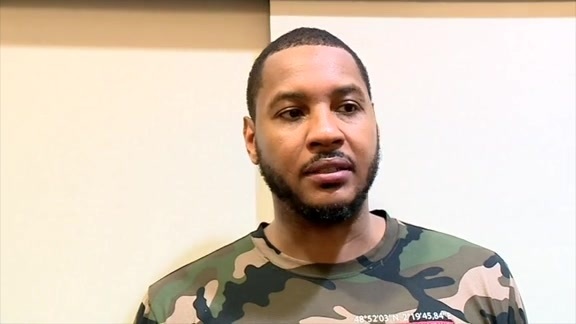 - Over the course of his 15-year NBA career, Anthony has been a part of a lot of different defenses, including some that were rated near the tops of the league. He believes that this Thunder team, which currently ranks third in defensive rating, has similar characteristics to teams in his past, but that this group has a little something extra.